The information, finance, insurance, real estate, professional service, management and administration industries continue to have the highest number of establishments and Gross Domestic Product produced in York. However, York is far behind Pennsylvania’s averages. The number of establishments in each sector has no direct correlation to the number of people the businesses employ nor the percentage of GDP produced. 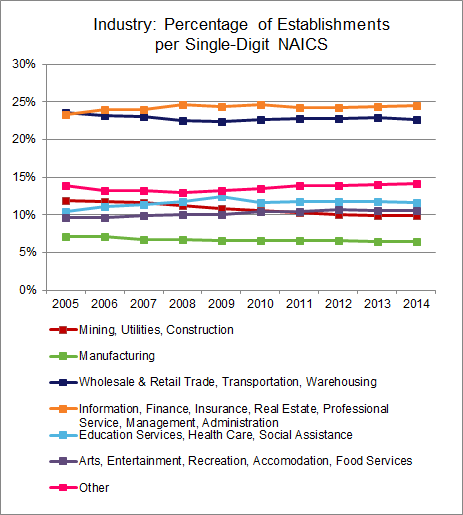 *North American Industry Classification System (NAICS) classifications are used; the 20 individual sectors are grouped by the first digit of their NAICS Industry Code, reflecting the broadest classifications of industries.